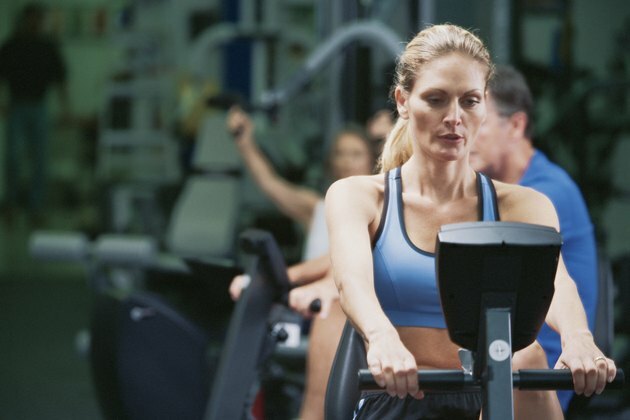 A recumbent bike offers a more comfortable workout than other cardio equipment, such as a treadmill or upright bike. Because you sit back in a semireclined position, some users feel that a recumbent bike doesn't provide an intense, effective workout. But you can get an efficient workout on a recumbent bike using interval training. Interval training is a short, intense form of cardio exercise. You alternate intense bouts of an activity with less-intense sequences. For example, you could sprint for a period of time and alternate this with jogging or walking. You can adapt most cardio activities, including recumbent cycling, to an interval workout. Increase the pedal speed or pedal resistance for the intense segments and lower these variables for recovery. The set time for each interval can vary. You can choose a one-to-one interval, or if you are a beginner, try a 2-to-1 ratio -- set up your recovery period to be twice as long as your intense period. If you are new to interval training, do your intense activity for 30 seconds and recover for one minute. As you become more advanced, increase your hard segments to one minute, but keep your recovery period at one minute as well. Start with a five-minute warm-up. Increase the pedal resistance and speed, and work out at 95 percent of your maximum intensity for 30 seconds. Lower the pedal resistance and speed for a 30-second recovery interval. Alternate between these two intensities for a total of 20 minutes. Finish with a five-minute cool-down. Experiment with different interval times for variety. Some recumbent bikes have built-in workout interval programs that automatically adjust the pedal resistance and prompt you to speed up or slow down your pedaling. A study published in the "Journal of Applied Physiology" tested the fat-burning capabilities of interval workouts. Eight women, both active and sedentary, rode a stationary bike for 40 minutes -- four minutes of intense exercise followed by two-minute rest intervals. All the women experienced an increase in the amount of fat their body burned after the workout. Although interval training will help you burn more fat, you can't lose weight without a proper nutrition plan in conjunction with your workouts.